I am an Early Career Fellow in the Institute of Advanced Study at the University of Warwick and a Sessional Tutor at Warwick's English and Comparative Literary Studies department, from which I also received my Ph.D. degree in June, 2017. This degree was funded by a Chancellor's International Scholarship and was jointly supervised by Prof Neil Lazarus and Prof Pablo Mukherjee. I have BA and MA degrees in English Literature from (Presidency College) University of Calcutta and from Jadavpur University, Calcutta, and MPhil degree in Cultural Studies from the Centre for Studies in Social Sciences, Calcutta (CSSSC), Jadavpur University. Before joining Warwick, I taught as part-time faculty in English at Rani Birla Girls' College, an undergradute college under Calcutta University. This thesis attempts to understand, through a study of postcolonial Indian novels, the nature and character of Indian (post)colonial modernity. Modernity is understood as the social condition that (post)colonial modernisation and development have given rise to. This condition underlies a historical crisis which is manifest in various kinds of catastrophic events – famine, peasant insurgency, caste violence, communal riot, state repression, and so on. By analysing three of these historical events – the 1943-44 Bengal famine, the Naxalbari Movement (1967-1972), and the state of emergency (1975-1977) – this thesis argues that a careful reading of the dialectic between event and crisis can offer crucial insights into the conditions of postcolonial modernity. It claims that novels that register these events are able to capture the event-crisis dialectic through their use of form and mode. Socially committed writers have adopted the realist form to represent the historical aspects and traumatising consequences of the events. However, because the nature, form, and orientation of these events are different, their realisms have undergone immense stylistic improvisation. The improvisation is shaped primarily by their use of literary modes. Modes are chosen to represent and historicise the specific character and appearance of an event. In order to represent the Bengal famine, Bhabani Bhattacharya and Amalendu Chakraborty have used analytical-affective and metafictional modes, while Mahasweta Devi and Nabarun Bhattacharya have deployed quest and urban fantastic modes to register the Naxalbari Movement and its aftermath. For the emergency, writers such as Salman Rushdie, O. V. Vijayan, and Arun Joshi have used magical, grotesque and mythical modes, and Nayantara Sahgal and Rohinton Mistry employ critical realist modes, defined sharply by the writers' class- and caste-based perspectives. These modes have shaped the realisms in the respective texts and transformed realist literary form into a highly experimental and heterogeneous matter. Contrary to the prevailing academic belief that modernity breeds modernism, the thesis posits that, in the postcolonial Indian context, the conditions of modernity have provoked a historically conscious, experimental, and modernistic form of ‘crisis realism’. 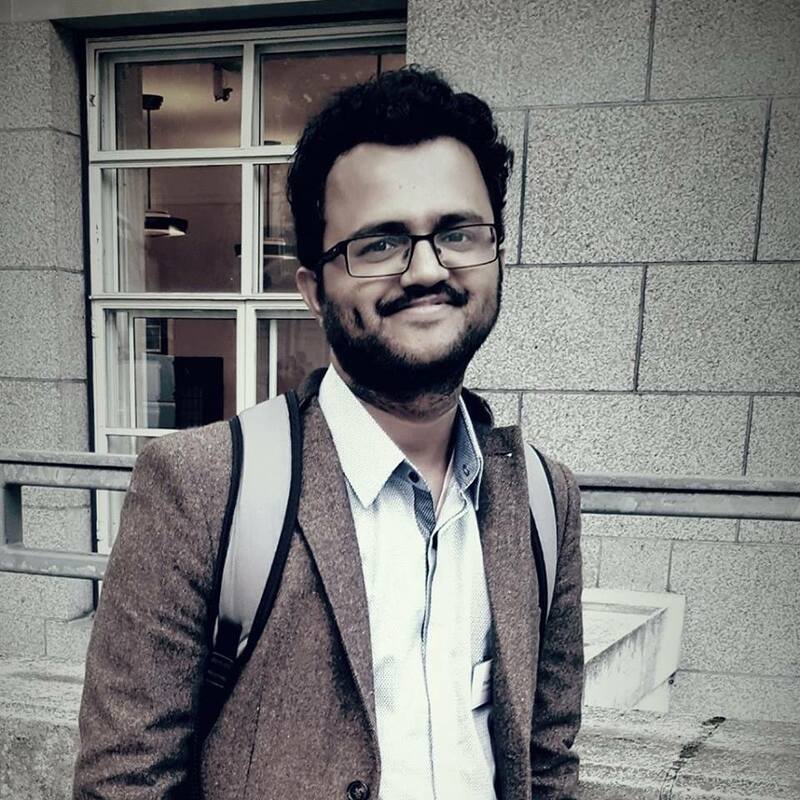 As a UGC-Junior Research Fellow at the Centre for Studies in Social Sciences, Calcutta (Jadavpur University), I wrote an MPhil dissertation on the representation of historical violence through the human-nonhuman relations in selected modernist and postcolonial texts (focussing on Franz Kafka, JM Coetzee, and Mahasweta Devi). In my immediate postdoctoral project, Empire, Famine, and World Literature, I will attempt to understand the recurrence of famine in colonized countries as a world-historical process, linked with European colonialism and imperialism. Literatures based on these famines from India, Ireland, South Africa, China, and Indonesia do not only register the tragic social consequences, they also use these famines to point out the global systemic exploitation by Europe in the 19th and 20th C and to mobilse anti-colonial and anti-imperialist resistance in the peripheries. This project will seek to understand the link between empire and famine and the worlding of a singular yet differentiated literary imagination through disasters. Other reserach interests include a monograph on Mahasweta Devi, and a project on little magazine movements in postcolonial India. My areas of research and teaching interest include postcolonial literature and theory, global anglophone literatures, world literary studies, environmental and disaster studies, refugee and migration, literary realism and modernism, and materialist criticism. I'm co-founding editor of the open access peer-reviewed online journal, Sanglap: Journal of Literary and Cultural Inquiry, which publishes scholarly articles on themed issues in literary and cultural studies research bi-annually. The journal is indexed in the Directory of Open Access Journals (DOAJ), the MLA International bibliography and the MLA Periodicals, the UGC Approved List of Journals (a key Indian index), and ProQuest (selected for inclusion), and has recently been selected for archiving and preservation at the Library of Congress. I have recently organised a panel on 'Postcolonial Disasters: Globalisation, Conflict, and Representation' in Postcolonial Studies Association's Biennial Conference in the Senate House, University of London, Sep, 18-20, 2017. Details here. Along with my colleague, Joseph Shafer, I held a funded conference on resistance studies at Warwick last April entitled, "The Matter of Resistance." Details here. In January, 2016, I helped organize a roundtable on understanding "world literature" from peripheral regions, focussing on struggle- and resistance-based readings, at the 131st Modern Language Association Annual Convention, Austin, Texas, and in July, 2016 I held a special panel on periphery, modernity, and South Asian literature at the 24th Biennial European Conference on South Asian Studies (Warsaw, 2016). I was also on the organising team for the inaugural Victorian World Literature conference at Warwick, May 2016.
editor, Sanglap: Journal of Literary and Cultural Inquiry (ISSN 2349-8064); recent issues include “Democracy, Resistance and the Practice of Literature,” “Censorship and Literature,” “Critiquing Humanism,” "Why World Literature," etc. "Disaster and Contemporary Literary Studies: A Review Essay." Journal of Commonwealth and Postcolonial Studies. Forthcoming, spring 2018. "The Question of Literary Form: Realism in Poetry and Theatre of the 1943 Bengal Famine." In The Aesthetics and Politics of Global Hunger. Eds. Manisha Basu and Anastasia Ulanowicz. Forthcoming, London and New York: Palgrave, (Jan) 2018. "Colonial Governance, Disaster, and the Social in Bhabani Bhattacharya’s Novels of 1943 Bengal Famine.” ARIEL: A Review of International English Literature 47.4 (2016): 45-70. Print. Review of What Postcolonial Theory Doesn't Say. Eds. Anna Bernard, Ziad Elmarsafy, and Stuart Murray. Interventions: International Journal of Postcolonial Studies 19.1 (2017): 144-146. Print. “The Margins of Postcolonial Urbanity: Reading Critical Irrealism in Nabarun Bhattacharya's Fiction.” In Postcolonial Urban Outcasts: City Margins in South Asian Literature. Eds Madhurima Chakraborty and Umme Al-wazadi. London: Routledge, 2016. 39-56. Print. "Nabarun, Srenisangram, Bastubad" (Nabarun, Class Struggle, Realism). In Nabarun Bhattacharya: Monon o Dorshon (Nabarun Bhattacharya: Intellect and Philosophy). Eds Arka Chattopadhyay and Adway Chowdhuri. Kolkata: Aihik, 2016. 215-225. Print. Review of Upmanyu Pablo Mukherjee’s 'Natural Disasters and Victorian Empire: Famine, Fevers and the Literary Cultures of South Asia.' South Asian History and Culture 6.4 (2015): 535-538. Print. “Neo-colonialism, Indigenous Struggle, and Mahasweta Devi’s Fiction.” In “Provincializing World Literature: Multilingualism, Resistance, and Literary Internationals.” America Comparative Literature Association Annual Convention, University of Utrecht. July 6-9, 2017. “Globalization, Postcolonial Ecology, and Critical Irrealism: The Fiction of Mahasweta Devi and Pepetala.” Other Globes: Past and Peripheral Imagination. University of Amsterdam. July 4-5, 2017. “Mode of Documentation: Mahasweta Devi's Fictional Writings and Peripheral Realism.” Special Panel, ‘Peripheral Modernity and the South Asian Literary-World.’ 24th ECSAS Biennial Conference. University of Warsaw. 27-30 July, 2016. "What is World Literature for a Postcolonial Nation?" World Literature and Dissent. School of English Resarch Colloquium, University of St Andrews. June 17-18, 2016. “Peripheral Modernity and the Indian Novel: Reading Tarashankar Bandyopadhyay’s The Tale of Hansuli Turn.” Roundtable, ‘Peripheral Aesthetics and World Literature.’ 131st Modern Language Association Annual Convention. Austin Convention Centre and JW Marriott, Austin, Texas. January 7-10, 2016. “Naxalite Movement and the Diaspora: The Historical in Jhumpa Lahiri’s The Lowland and Neel Mukherjee’s The Lives of Others.” Postcolonial Studies Association Inaugural Annual Convention. University of Leicester, September 7-9, 2015. “State and the Rebels in the Postcolony: Critical Irrealism in Mahasweta Devi and Nabarun Bhattacharya.” Subverting the State: the Postcolonial Predicament. University of Kent. May 22, 2015. “Disaster, Geography, and Literary Realism: Three Novels of the 1943/44 Bengal Famine.” Reframing Disaster. University of Leeds. 28-29 November, 2014. “Jibanananda Das and Walter Benjamin: Translation, Collectivity, World Literature.” Alternatives: Translations and the (Anti)Canon. University of Glasgow. April 24-25, 2014.